I picked up my copy of Romancing Wisconsin Volume I Holiday Boxed Set yesterday. I can't wait to read it! Books by a terrific author, an awesome price and it helps a great cause, what more can you ask for? For the past two years, I’ve donated the royalties from one of my books for the entire month of December to a charity. In 2013, I’m switching it up and splitting it up to benefit more than one charity in a couple different months. 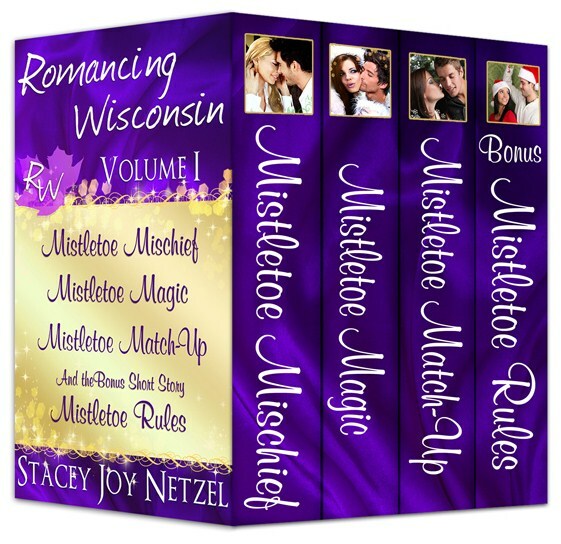 This June I’m donating 25% of my net royalties for the Romancing Wisconsin Volume I Holiday Boxed Set. It includes Mistletoe Mischief, Mistletoe Magic, Mistletoe Match-Up, and the exclusive bonus story, Mistletoe Rules. Holiday stories in June, you ask? (and even if you didn’t, pretend you did) Well you see, the first story is actually Christmas in July at the zoo, so I’m just a month early on that one. Plus, these heartwarming stories will make you want to celebrate Christmas any time of the year—and Santa Butch is a treat you don’t want to miss. Best part of all, your purchase (or gift to someone else) not only gets you the boxed set, but you’re helping out a great organization that helps the men and women injured in the line of duty to their country. In December 2012, I donated to a local no-kill animal shelter because my heroine in Mistletoe Magic runs an animal rescue. Reader generosity allowed me to write Happily Ever After Animal Sanctuary a check for a little over $6000. But then I felt a bad because Janelle’s hero Mark is an Army veteran who served in Afghanistan, and he deserves to be spotlighted, too. So for this round I’ll be donating my royalties for RWVI to theWounded Warrior’s Project to help US veterans injured in the line of duty. For the first six days of June, I’ll have the Romancing Wisconsin Volume I Holiday Boxed Set on sale for $0.99. Yes, you read that right, less than a dollar! Regular price is $4.99, so it’s a great deal, plus you get the exclusive bonus story. If you’re reading this after June 6th, the price will be back to $4.99, but remember, my donation will keep adding up through the entire month of June, so please still consider picking up a copy. US veterans and I will thank you! Then keep track of the number of copies sold on my blog! www.StaceyJoyNetzel.com I’ll keep a running total on the sidebar and do an update at the end of the month. You can check out excerpts there, too. Again, thank you very much for your generosity! Feel free to share this with friends on any of your social networks.